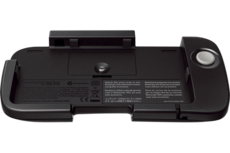 A Nintendo 3DS XL version of this add-on, the Nintendo 3DS XL Circle Pad Pro, was later released following the release of the system, on November 15, 2012 in Japan, March 22, 2013 in Europe, and on April 17, 2013 in North America. In North America, the Nintendo 3DS XL Circle Pad Pro was released exclusively on Nintendo's online store. The Nintendo 2DS does not have a version of this accessory, nor does it support either of the existing Circle Pad Pro accessories due to the system's different design. As New Nintendo 3DS systems feature a C-stick and ZL and ZR buttons built onto the hardware, they do not support either version of the Circle Pad Pro accessories while still supporting Circle Pad Pro features in compatible games. The Circle Pad Pro connects to the system using an infrared transceiver positioned over the system's own built-in receiver, allowing the system to wirelessly accept inputs. The accessory is designed to fit around the system like a cradle, and is shaped to give it the feel of a standard console controller. In addition to the second Circle Pad, the device also features two trigger buttons (ZL and ZR), as well as a second R button, since the system's own R button would be unreachable due to the cradle. The Circle Pad Pro requires one AAA battery for power, and is estimated to have a battery life of approximately 480 hours. The device also comes with slot for a wrist strap, one of which comes packaged with the device. Photograph of the Circle Pad Pro. Nintendo 3DS with the Circle Pad Pro attached. The Nintendo 3DS XL Circle Pad Pro. Nintendo 3DS XL with the Circle Pad Pro attached. ↑ 3DS Circle Pad Pro Has 480 Hour Battery Life. IGN (December 8, 2011). Retrieved November 7, 2015. This page was last edited on 7 October 2017, at 02:32.